The election of 1959 was a test of whether the Alliance would survive as a coalition party of the three races in the country — the Malays, Chinese and Indians. The MCA was, at that time, led by Dr Lim Chong Eu, a doctor from Penang, who had shown up to that time, a degree of brilliance in politics. Unfortunately, during his stewardship of the MCA, he tried to get away from the foundations which had hitherto held the Alliance together: citizenship for the Chinese in return for their acceptance of Malay as the national language. On the eve of the elections, he tried to demand more seats for the MCA rather than agree to the accepted method of allocation of seats used by the Alliance in previous elections. I tried my best to effectuate a compromise, but failed. As is often the case in times of crisis, the Tunku was firm and refused to yield: he said that he would not give in to threats and that he would stick by the old formula even if only a handful of MCA members remained in the party. The Alliance fought the elections without the support of Dr Lim and his followers and won by a handsome majority. When the Alliance formed the Government after the 1959 elections, I was again allotted the Ministry of External Affairs. I pursued the same policy as before the elections with instructions to the Ministry and our missions abroad to consolidate rather than enlarge our activities. After the election, Tunku went to England and later to Europe. In Europe, he had a long talk with Charles de Gaulle who was embarking on his own independent policy. De Gaulle convinced the Tunku that communist China should be recognized and admitted to the United Nations. Without consulting me and the Cabinet, Tunku, on his arrival in Kuala Lumpur, announced a sudden change in our policy towards communist China. At that time, we had refused to recognize either China or Russia. When the Cabinet met, I told them that I could not accept the new policy towards communist China and that I proposed to resign. My term as a member in the Federal Legislative Council was never dull. After only a couple of months as member of Lands and Mines and Communications, Road Transport was added to my “Ministry”. A “Cabinet” committee on this had been set up with Dato E.E.C. Thuraisingham, Mr Yong Shook Lin, Tun Sir Henry Lee, and Tunku Abdul Rahman as members. Dato Nik Kamil wisely never asked this committee to meet and its first meeting was therefore held when I became responsible for Road Transport and by virtue of this, Chairman of the Committee. I had said earlier that one of the ways by which the Tunku tried to build himself and the party up was to champion any cause which at that moment was arousing public interest. Malay participation in road transport was such a cause. Briefly, there were two ways by which Malays could participate in the road transport business: first by issuing new licences in addition to the existing ones, and second by redistributing existing licences by taking some of them away from the Chinese and giving them to the Malays. The difficulty with the first is that because of the very nature of the structure of road transport, there had to be new routes available before new licences could be issued. This was particularly the case with buses, but not so much with taxis. Dato Onn and his crowd in the Federal Legislative Council decided to take political advantage of this at the expense of the Alliance. All the Tunku wanted was for the Malays to be given extra taxi licences and if he succeeded in this, it would enhance his prestige and that of the party's. Dato Onn kept on plugging the line that the Chinese must show their good faith to the Malays by giving up some of the licences then owned by the Chinese bus companies. The atmosphere was anything but conducive to an orderly meeting. To make matters worse, the Secretary of the Committee was an inexperienced expatriate officer. Instead of preparing and submitting the minutes of each meeting as a summary of what took place, he insisted on preparing one in which he reported what each member was supposed to have said. One of my earliest recollections of childhood days was a journey, which my parents and I made to Singapore. There was no causeway then across the Straits of Johor. We had to get into a ferry which carried us across to the train at Woodlands. The train journey from Woodlands to the city of Singapore took about an hour. When we landed at Singapore city, my parents hired a horse and carriage. Our journey to my parent's friend's house was a musical one, because the bells tied to the horses’ heads and bodies jingled as they trotted along. My father's friend was a Chinese gentleman. His house in Singapore city was a shophouse type of building but to me, as a child, it appeared as a big, spacious building. The ground floor was used as a garage and it was full of cars. He was definitely a wealthy Chinese at that time, but years later when I grew up, I met him again. He had lost everything on tin mining. Ours was a unique family. My father was reserved and hardly talked to anyone of us, and when we wanted to ask him for something, either money or some presents, we had to write to him. My memory of my mother, who died when she was in her early forties, is that of a vivacious woman, warm-hearted and great. She hardly knew any English, but she always surprised me by holding conversations with a lady friend of the family, who only spoke English, for hours on end. Although there were already nine of us in the family — four boys and five girls — both my parents were very fond of taking in Chinese girls as adopted children. I can only remember nine of them. They were brought up no different from my sisters, enjoying the same amenities, and being taught together how to cook and look after the house. They all married well and no one looking at them now could imagine that they were children of Chinese parents. My paternal grandmother was very fond of travelling and this was made possible because she had many married daughters whose husbands were posted in many faraway places in the State of Johor and also because she enjoyed visiting her other relatives. The growing strength of the Alliance both as shown in its success at the polls and by the increasing number of its supporters was not without notice from the colonial administrators, especially Sir Gerald Templer, a shrewd and able man. When Sir Gerald became High Commissioner, the Tunku and myself were made members of the Federal Legislative Council. The Tunku was also made a member of the Executive Council. During the period from 1948 to 1955, the Federal Legislative Council consisted of official members and nominated members. The nominated members were appointed by the High Commissioner to represent various “interests” in the country, but apart from European members who represented British commercial and industrial interests, the majority of members until Dato Onn left UMNO were either members of UMNO or the MCA. After the Tunku took over the leadership of the party, there were only a handful of UMNO members left; the others had followed Dato Onn. Looking back now on the old Federal Legislative Council, it can be generally said that its members were on the whole able men and if it had not been for the fact that the contentious theme for the period was that of independence, they would have served the country quite well. The President of the Council, Mr Donald MacGillivray, was an able, shrewd administrator, typical of the breed which the colonial office was sending out at that period to her troubled colonies. The Chief Secretary, Sir David Watherston, was a conscientious civil servant whose behaviour and attitude was more of a priest than a civil servant. Sir Michael Hogan, the Attorney General, was a brilliant Irishman who must have kissed the Blarney Stone much earlier than any ordinary Irishman because his eloquence was supreme and this, coupled with his wit and superb presentation of his case, made him admired and respected by all. Among the Asian members, Mr Yong Shook Lin was noted for his clear advocacy and the sing-song style of his oratory; Dato E.E.C. Thuraisingham for his verbosity about nothing; and Dato Onn for his superb eloquence both in English and Malay. As for us UMNO and MCA members of the Council, we were more interested in the political issues which were debated in the Council. This book has been a Malaysian publishing sensation. It was an instant bestseller. In launching its Malay language edition, the Raja Muda of Perak, Raja Dr Nazrin Shah, was moved to tears by remembrance of how much Tun [Dr] Ismail had contributed to the nation, and how much more still needed to be done. Tun Dr Ismail bin Dato Haji Abdul Rahman is a worthy subject for a political biography. After completing a medical degree in Australia, he became a Johor state councillor in 1948, joined the United Malays National Organisation (UMNO) in 1951, and then in 1953 became party representative in the Federal Legislative Council with portfolio responsibilities for Lands, Mines, and Communications. He continued to hold ministerial responsibilities thereafter through to [his] retirement in 1967. At the same time, he helped shape the UMNO independence struggle, was returned in the first national election in 1955, then became the first ambassador to the United States and the United Nations for over twelve months after independence in 1957. Returning to Malaya, he took on the External Affairs portfolio; then in November 1960 he began a long association with security issues, first as minister of a new internal security ministry, then from February 1962, in home affairs. Forced to retire by ill health, he joined the boards of several multinationals, and gave speeches on the neutralization of Southeast Asia. Recalled to government after the tragic racial riots of May 13, 1969, he held leading positions during emergency rule in both the National Operations Council and the Cabinet, and became Deputy Prime Minister in September 1970. Seemingly destined for Malaysia's highest political office, he was struck down by a heart attack in August 1973. It helps the biographer's cause that apart from being a statesman, Tun [Dr] Ismail led a colourful and adventurous life. He was born into politics as a member of the Johor aristocracy. His father was the state treasurer of Johor, then first president of the Malayan Senate, and three brothers all had important political roles. He was brought up in a multiracial environment, establishing close friendships with the Kuok and Puthucheary families, which lasted a lifetime. A grandmother was half-Chinese, and his family adopted nine Chinese girls (a common practice in well-off Malay families in those days). Shortly before Merdeka was declared, the Tunku spoke to me about going to Washington, D.C., as our country's first ambassador to the United States of America and at the same time, accredit myself to the United Nations as Malaya's first permanent representative. He said the choice was between Razak and me and honestly, he said, he could not spare Razak as he wanted him in Malaya to assist him. When I accepted the offer, relatives and friends speculated that I had been banished. This thought never occurred to me. It satisfied me to be offered a position which would enable our newly independent country to be known abroad. Our journey to Washington was partly nerve-racking, partly humorous, but never dull. Our party consisted of four women, nine children and thirty-one pieces of luggage, and only two men: Ismail bin Mohamed Ali (now a Tan Sri and the Governor of Bank Negara) and myself. When Dato Onn left the party, the leadership fell into the hands of Tunku Abdul Rahman who, it is commonly believed, was persuaded by Tun Razak to accept the leadership. The first time I met the Tunku was in Kuala Lumpur when my wife and I were on our way to Penang for our honeymoon. On one of the evenings when we were in Kuala Lumpur, we were invited by my friend, Mr Eugene Seow, who was an architectural student with me in Australia, to his flat. When we arrived, we saw a man drinking gin in the corner. We were introduced to him and I was struck by his friendliness, charm, and unassuming ways. Without hesitation, he invited all of us to spend the evening with him at the Kuala Lumpur Flying Club. He kept us there until he was told that we were on honeymoon. In typical fashion he bundled us off telling us that we had no business being on the dance floor so late when we should be in bed enjoying our honeymoon. When the Tunku took over the leadership of UMNO, the Malay Graduates’ Association received a message from him asking it to nominate a member to serve on the Central Executive Committee of the party and he mentioned his preference for me. I was at this time an established medical practitioner in Johor Bahru and a member of the Johor State Council, the only one who was not an UMNO member: I was nominated a member of the Council on the establishment of the Federation of Malaya in 1948. One of the first things I did in the Council was to oppose the establishment of the Federation because it was constitutionally illegal, especially with regard to the Johor Constitution and I pointed out that I wanted my objection recorded in the proceedings of the Council. It was also while I was a member of the Council that Dato Onn tried to persuade me to join UMNO and said that if I agreed to do so, he would nominate me as a member of the Federal Legislative Council. I tried to reject him at first by politely stating that I was not prepared to sacrifice my medical practice to become a full-time politician. For some of us in the delegation, this was our first trip to London. We arrived in October and were housed in St. James’ Court as guests of Her Majesty's Government. It always amuses me even now as I reminisce, that some people thought we were housed in St. James's Palace instead of a hotel where the British government usually place their overseas guests. This was also my first trip to London. I had heard so much of London from Suleiman who spent no less than six years there. We lost no time in sampling London: its night life, its shopping centres and, above all, its girls. I always tell my friends that of all my trips abroad — I have travelled no less than six times around the world — I liked this first trip to London the best. Our delegation was composed of men who got on well together both at official meetings and at social functions. As I said some of us were in London for the first time and were enjoying the big city as children would. The rest, who had been students there, like the Tunku and Razak, were kind enough to guide us throughout our stay. From the time that we landed at London airport, it was obvious that our mission was going to be a success because a certain high official in the Colonial office told us that what we came for would be handed over to us on a gold platter. The Colonial secretary then was Mr Lennox Boyd (now Lord Boyd) and he and the Tunku hit it off well together. The meeting was conducted in a typical fashion: there was a main meeting called the plenary meeting and in addition, there were the meetings of the various committees. I remember that in addition to attending the plenary meeting (which all members of the delegation attended), I attended meetings of the Finance Committee and the Civil Service Committee. The chairman of the Finance Committee was Sir Hilton Poynton and he was a hard nut to crack. At the Civil Service Committee, we succeeded in drafting a scheme of compensation for the expatriate civil servants in Malaya; the ease with which the Malayan Civil Service was transferred from the hands of the expatriates is a tribute to the soundness of the scheme. This is the unfinished autobiography of Tun Dr Ismail Abdul Rahman, the medical doctor who held key government positions in the first two decades of Malaysian nation building, and who was an important early player within UMNO, the country's dominant political party. Drifting into Politics was found among the private papers that were handed over to the Institute of Southeast Asian Studies (ISEAS) in 2005 by Tun Dr Ismail's eldest son, Mohd Tawfik. 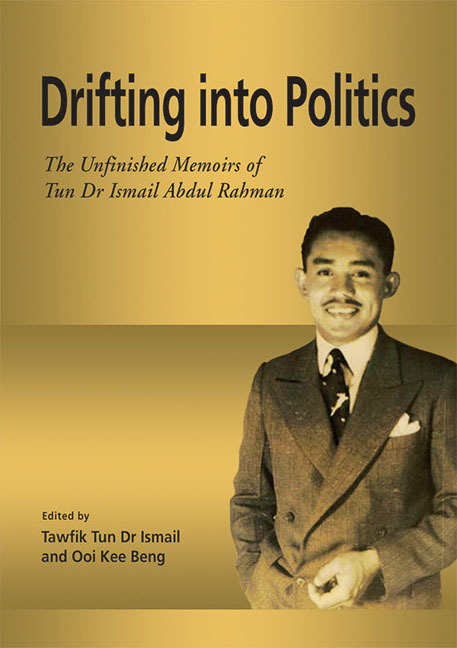 The family has asked for it to be published in 2015, this year being the 100th anniversary of Tun Dr Ismail's birth. This is an apt time indeed to make his reflections on his own life available to the world. This is also the third book to come out of the Tun Dr Ismail papers which are kept at ISEAS Library. The Reluctant Politician: Tun Dr Ismail and His Time, the biography written by Ooi Kee Beng and published in 2006 is ISEAS's all-time bestseller, and it brought Tun Dr Ismail back with great impact into Malaysian political analysis and discourse. It has been translated into Malay and Chinese. The second book – Malaya's First Year in the United Nations – has also been welcomed by scholars of Malaysia's foreign affairs and diplomacy. This present volume continues Malaysia's rediscovery of Tun Dr Ismail. The Malaya I returned to after five years in Australia was totally different from the Malaya I left behind. Before the war, politics was discussed among the select few. Immediately after the war, political feeling engulfed Malaya like a fire engulfs a forest on a hot, dry day. When I returned on 4 July 1945, the first person I met was my eldest brother. He attracted not only my attention, but also that of others on board the ship by the way he dressed. Other people on the wharf were dressed in shabby shirts and crumpled trousers while he was immaculately dressed in white sharkskin complete with shirt and tie to match. His name was Suleiman. He was later to distinguish himself as the man who dared to challenge and defeat Dato Onn bin Ja'afar at the first national elections in 1955. After his victory, Suleiman held the attention of Tunku Abdul Rahman who treated him with great affection until he died. The Tunku made him a minister in successive alliance governments and when Suleiman's health was failing, he requested the Tunku to send him to Australia as High Commissioner. He died in harness, in Australia, while delivering an important speech on Malaysia. It was Suleiman who briefed me on the controversy over the Malayan Union. The spearhead of attack against the Malayan Union was the United Malays National Organisation (UMNO). In fact, UMNO owes its birth to the Malayan Union. As the Malays saw it, the Malayan Union was designed to deprive the Malays of their rights in the country, first by the abolition of the Malay Sultanate and second by the abolition of the special status accorded to the Malays. Dato Onn united most of the Malays under him in UMNO and fought against the Malayan Union by political means. Other Malays, especially those from Johor, thought that the opposition should be based on legal grounds. Their reasoning was based on the constitution of the Malay states which existed prior to the war. A few weeks after my return from Australia, I already had the feel of politics in Malaya. My analysis of the events, occurring at that time was as follows: there was an awakening among countries under colonial rule after the Second World War. Nationalism, which was suppressed by the colonial powers before World War II, seized the opportunity created by the havoc and dismay of war to rear its head. It did so in Southeast Asia and its manifestations were so clear that those who were keen observers could not fail to see them. Malaya was heading for independence, of this I was certain. What I was not certain of was how long it would be before she finally achieved it. As I saw it, the pace would be dictated by the national leaders while the British would try their best to thwart them. There was not a doubt that the man of the moment then was Dato Onn. He had mobilized Malay nationalism and directed it against the British. The question was how far he was prepared to go against the British — would he be prepared to lead the country to full independence or would he stop once Malay rights were restored? As a Malay leader, he was brilliant, and would have been eminently successful if the Malays formed an absolute majority in this country. He was not, however, big enough to face the realities of Malayan politics. Although towards the peak of his career he tried a Malayan solution rather than a Malay solution to the political situation in Malaya, he was not successful because he did not believe in what he was doing. At this time, there were about half a dozen returned students living in and near Johor Bahru, including myself. We called our group “The Malay Graduates’ Association”. We used to meet fairly regularly to discuss politics. I usually get inspiration and ideas during the course of discussion and it was during such an occasion that this thought passed through my mind: I felt that if intellectuals such as ourselves wanted to play a role in the movement for independence, we had to be active in the right way and not be passive. I was in the United States from August 1957 till December 1958. I returned to Malaya via Italy and arrived in Kuala Lumpur in January 1959. I had towards the end of 1958 written to Tunku of my decision to return and contest the Parliamentary Election of 1959. He agreed to my request. Although I returned to Malaya after only an absence of oneand- a-half years, I saw progress which could not have taken place if Malaya was still a colony. I was also quite pleased to note that although I had been away, my political stock in the party and the country was high. The Tunku had decided on my return to go on leave, to work for the party to ensure that we won the forthcoming elections with a big majority. He assigned me to the Ministry of External Affairs where I decided that our foreign policy should pursue an independent line, by which I meant that our stand on international problems should not be influenced by the policies of other countries, big or small. I learned when I was at the United Nations — where in addition to being a member of the Commonwealth group, we belonged also to the Afro- Asian group — that the surest way to get into trouble was not to have a definite policy of our own on foreign issues because then we would be at the mercy of others. Although our policy of moderation in the United Nations did not get the approval of many members of the Afro-Asian group, we were respected because our policy was definite, logical, and consistent. It was while I was Minister of External Affairs that I went to Jogjakarta to attend the Colombo Plan meeting. I met President Sukarno for the first (and only) time and heard him speak. What I saw of Indonesia then depressed me especially after I had discussions with Dr Subandrio on the Association of South Asia (ASA). He was interested only in bilateral economic arrangements in so far as his interest in economics (which was not very far) was concerned. He told me he did not care very much about the economy of Indonesia so long as the revolution remained unfinished.